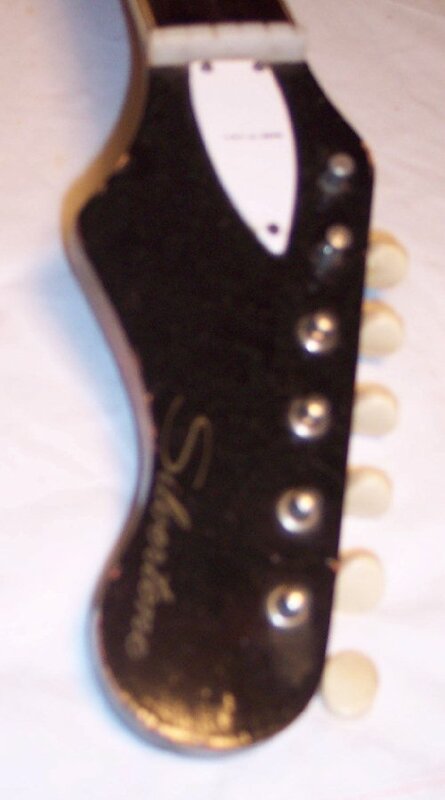 The original neck can be seen / compared here, here, here and here. 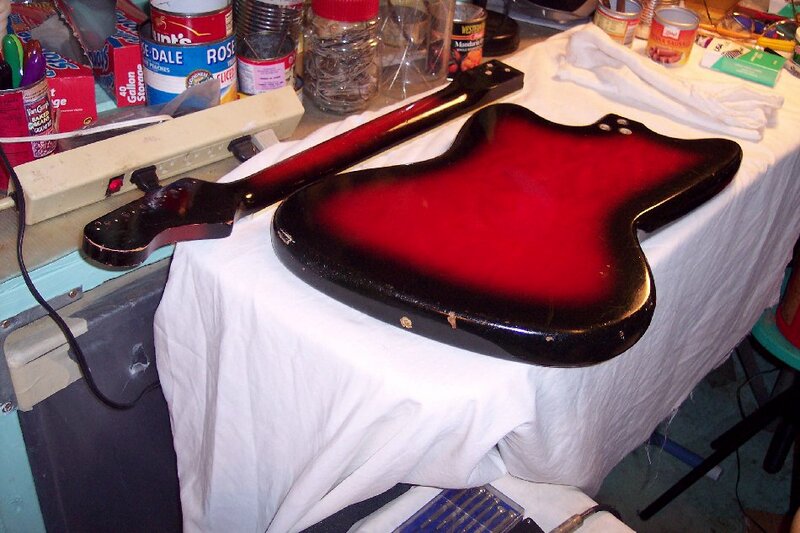 ( Although I don't think it will become an issue at all; I will expertly hand touch up any wear on the new neck's finish to make it closely match the finish condition of Coop's Devil's Oldsmobile Rocket 88 ). 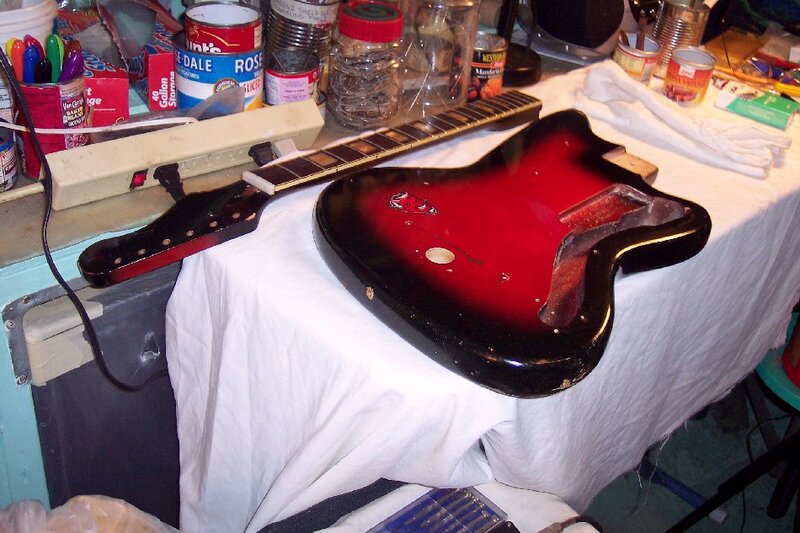 Anticipating nominal clean up and set-up work on the new neck; Coop Devil's ride will also be ready for reassembly with nominal remaining work. I will update the work tasks status webpage just as soon as I can without losing time on the guitar. Tasks such as schematics, switching logic and other supplemental info and data can be done when guitar ships. How DID I miss such a thing??? Well, I had removed the plastic trussrod cover plate for repair some time ago, and then packaged it in a small zip loc bag attached to this guitar. My attention was on the cover, and many trussrod nuts are recessed quit well, and thus easy to miss if your task / focus is not looking down into the trussrod access channel. There had not been any task on this guitar so far, to look down into the channel, until the trussrod came up in the work sequence. (1) REMOVING THE FRETBOARD for trussrod access: Remove the neck binding, heat the fretboard to remove it to gain access to the whole trussrod for replacement. 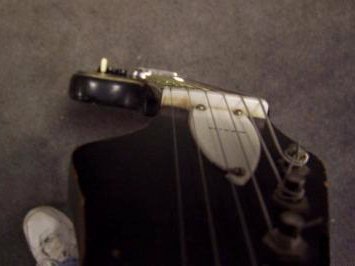 This is a dreaded option because besides the time involved in such exacting surgery, ...the fretboard markers are also glued in with heat-glue and heating the fretboard will loosen the markers, often to the point that some of them have to be reset and often removed to do that. Time has already become a problem for my Spirit in taking too long for an excellent Customer, ....and my time on this guitar having been interrupted several times with personal challenges. 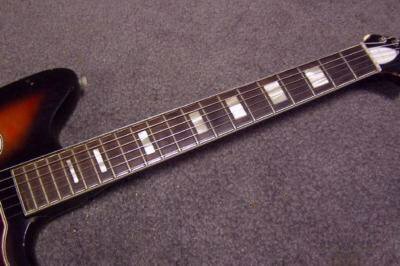 Adding the additional considerable time to remove the fretboard was a last-ditch option. 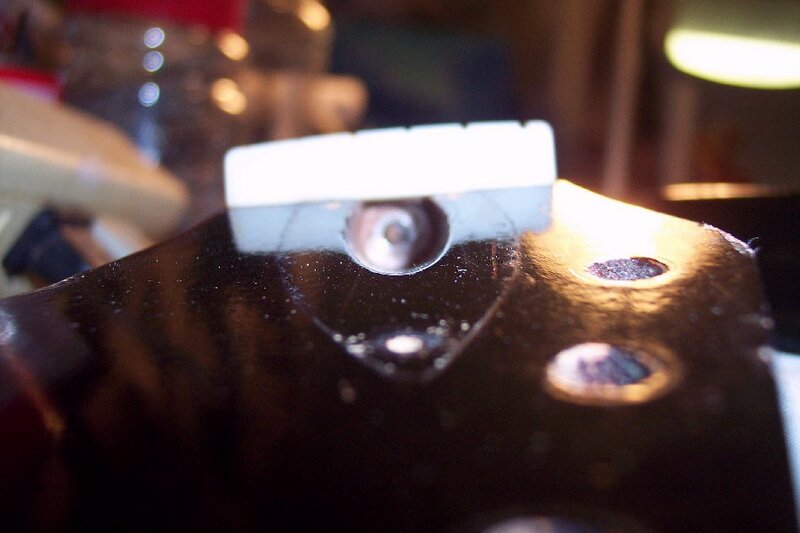 (2) REAMING THE TRUSSROD NUT CHANNEL: Make a deeper channel for a new nut by reaming around the trussrod. deepening it's channel beyond where the trussrod snapped off, tap (or tap-clean) new threads onto the trussrod to accept another new nut in the deeper channel. 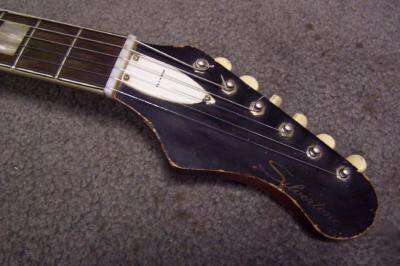 Although this usually works, and is a common repair for this type of problem; Sometimes it doesn't work, .....and it does non-original surgery on the guitar, .....and (imho) weakens a spot on the neck where the headstock joint runs at a wedge angle to join the neck between the nut and 3rd fret or-so. When I do such a repair I fill that area with epoxy around the trussrod to solve the weakness problem. 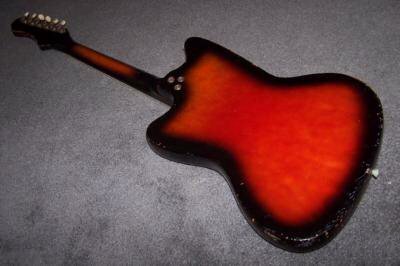 ------- I would much rather the repair result in maintaining this all original guitar. This webpage is under ongoing construction. 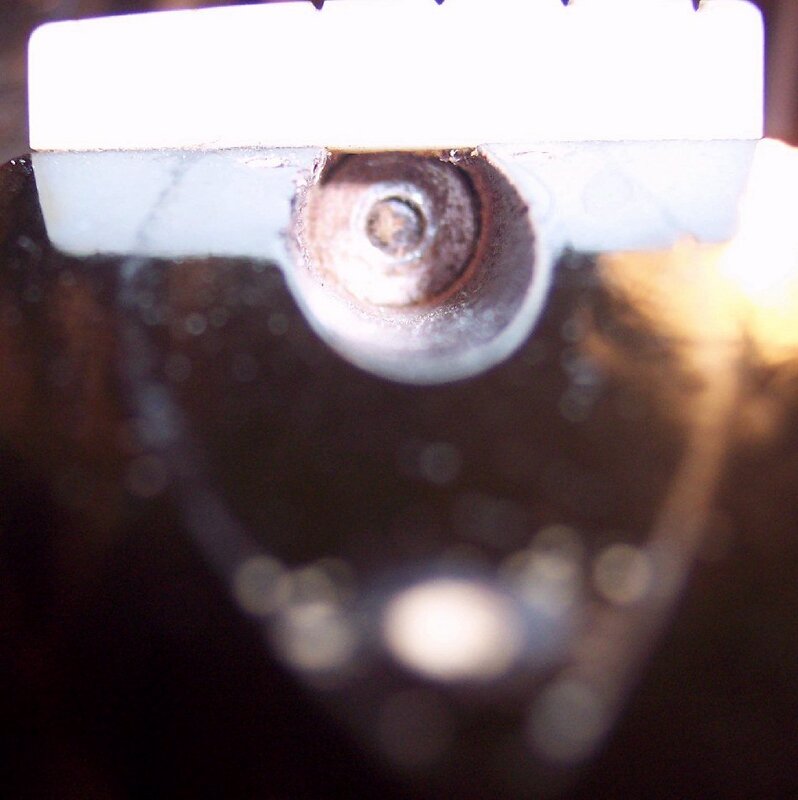 Trussrod is sheared off at adjusting nut junction. Nut was not under the cover; Which, with negative bow in the neck, means a previous owner knew the problem and didn't disclose it. I did not discover it until the time came to start adjusting the trussrod 1/4 turn each day. Trussrod nut race bearing (washer). Of course the first choice of options is to buy another exact-same model & color neck, or another same model guitar to exchange the neck out with; Which I am trying very hard to do in both networking and internet searches several times each day. Here's close looks inside the nut access channel and the remains of the snapped-off trussrod. Button button ......who has the button. Where is the trussrod nut that is supposed to be right here? ? ? NOT GOOD. Someone sheared off the trussrod at the nut junction, usually by trying to turn the nut more than 1/4 turn each day, ....but also occasionally / rarely due to it having been stressed one or more times in it's past. In any event, the person I bought it from should have known it was broken because it was from a guitar shop / seller which should have tried to adjust the negative neck bow via the trussrod and noticed it before selling it, just as I did when it came time to start adjusting the trussrod. Stay tuned. My demoralized state of being will subside as soon as I find another neck or donor guitar, ...or finish assessing and compiling options to post here for us to make respectable decisions upon. How in the world did this slip past me ? ? ? ? ? (And that question stressed and bugged the heck out of me until I figured it out, said later here). NO TRUSSROD NUT ... SNAPPED OFF some time ago! UPDATE: Having found a donor guitar for a neck exchange and solving that taxing priority with much relief; The guitar should be ready or very close to being ready for reassembly as soon as the new guitar is received and the neck removed and spiffed up for the Coop De'Ville. And if I'm real lucky I'll have free time between tasks (or for eyeball / brain rests) to post that progress here on the webpages. The speed of craftsmanship is often dependent upon the amount of stress in the "atmosphere"; And finding the neck after almost 2 weeks of comprehensive searching, and thus able to satisfy this guitar and it's new deserving owner, ....relieves ALLOT of stress.